The Endowment is pleased to announce $325,000 in research funding for the 2017-2018 fiscal year on projects addressing important floriculture/horticulture issues. 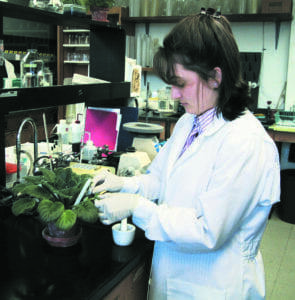 “The floriculture industry faces complex challenges that AFE-funded research helps address,” said Terril Nell, Ph.D., AFE Research Coordinator. The funding will support four new projects and seven continuing projects. The goal of all AFE research is to provide knowledge that helps the industry grow stronger. Objective: Key enzyme and protein groups are being classified in Lily as a means of using this information in traditional breeding programs to create plants with favorable traits such as: stronger stems, pests/disease resistance, more colorful flowers and just the right amount of fragrance. Objective: Establish the temperature sensitivity for cropping time of current petunia and calibrachoa cultivars leading to an understanding of the genetic relationship of temperature and flowering. These results will provide commercial breeders with information to develop cultivars that will flower in the same time as plants grown at warmer production temperatures. Objective: Develop plants with a modified plant defense gene (NPR1) that will result in plants with resistance to downy mildew during production and in the landscape. Objective: Develop and understand the relationships between the greenhouse environment, such as temperature, humidity, leaf wetness and cultural practices on Botrytis spore populations in cut roses. Objective: Evaluate the persistence of Beauveria bassiana, an insect-killing fungus, that when combined with a solid nutritional substrate (millet) in the potting mix will provide control of western flower thrips for longer periods. 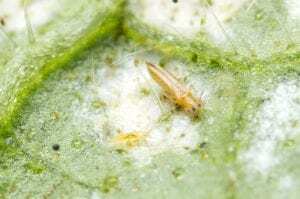 Objective: Investigate the use of cutting dips containing reduced-risk materials (insecticidal soap, mineral oil) and biopesticides (Beauveria bassiana) as a means of reducing thrips infestations on propagative materials to levels where they can be easily managed thereafter using biocontrol. Objective: Demonstrate that use of lower volumes of water applied during irrigation can produce high-quality bedding plants with improved shelf life at retail while conserving water during production. Objective: Improve our fundamental understanding of ethylene chemistry in plants, offer new and better ethylene antagonists for wider use, and provide ways of managing post-harvest quality of flowers and shelf life. 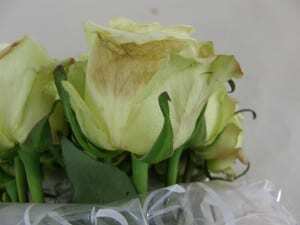 Objective: Identify the relationship between ethylene sensitivity and Botrytis susceptibility of cut roses and whether use of anti-ethylene agents reduce Botrytis development. Also, the relationship of temperature and relative humidity conditions inside shipping boxes will be related to incidence of Botrytis relative to packing materials and pre-cooling methods. Objective: Supplemental lighting is most efficient when little sunlight is available. Programs will be developed to effectively use supplemental LED lighting based on environmental conditions and plant growth requirements. Also, the use of far-red supplemental lighting will be evaluated to induce flowering in short day plants. Objective: This project will provide an understanding of how sole source LED lighting from red, blue, far-red and ultra-violet lighting will affect growth and development on a broad range of floriculture crops (including bedding plants, herbaceous perennials and cut flower transplants). Click here for more information on AFE research.